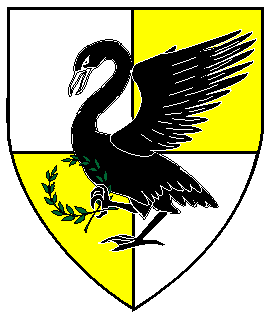 Their Highnesses Rolf the Relentless and Danaë FitzRoberts wish to invite the populace of Cynagua and the Kingdom of the West to come celebrate and bear witness to the Investiture of Their Heirs, Seth Mac Alpin and Gwendwyn The Silent, the Lord and Lady of the Swan. Feast Tickets : $15.00 They can be purchased through Cynaguan Exchequer E'tain ingen Chellaig (Kelly Jean Percefull) on FaceBook or via email exchequer@cynagua.westkingdom.org. This event will soon have the site fees and feast tickets available to be purchased through PayPal. $20.00 non-Members, $15.00 for Members, 17 and under free. No Family Cap. From the North, South or East, take I-5 to Woodland. Take the Hwy 113 North Yuba City exit. **At the light, turn left onto East Street. Just past the rice mill, turn right onto Kentucky Ave. Take the first left turn onto Palm Ave. The lodge is the big white building on the left, with a big blue square and compass on the front. There is parking behind the building. From the West (Bay Area) take I-80 to Davis and take Hwy 113 North to Woodland. Hwy 113 will merge with I-5 North. Take the next exit, Hwy 113 North Yuba City, and proceed as from ** above. Carpooling is suggested due to limited parking availability.